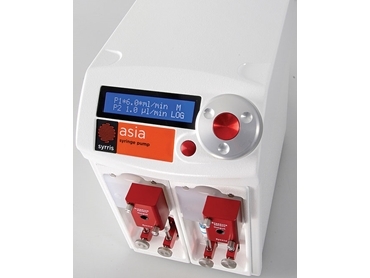 Asia Pump, the new ultra-smooth range of syringe pumps designed for flow chemistry by Syrris is now available from John Morris Scientific . Asia flow chemistry pumps have a rating of 20 bar (300 psi) and are extremely chemical-resistant with all wetted surfaces made of glass or PTFE. Produced to the highest specification, the flow rate and volume can be easily controlled by the intuitive front panel (twist and click control knob) or the Asia PC software. The PTFE pressure sensor ensures safe operation by automatically stopping the pumps in the event of over pressure. Components such as valves, syringes and pressure sensors are quick and easy to attach as they clip in and out without tools.